Load regulated locomotive decoder with 6 function output, and 1A motor drive output. Can control two RC servo. Module is equipped with two relays, which can polarize turnout frog, and switch any load at the two end position (one changing relay contact). 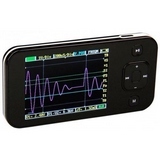 Mini digital storage oscilloscope for easy booster output, LocoNet Pull-up and LocoNet Syncron check. Block occupancy detector and feedback module for LocoNet bus. Independently programmable feedback address for 8 inputs. Digital booster, with 3A output. The several inputs can receive the XpressNet socket(Roco, Lenz), Lenz 3-pole socket, LocoNet socket, DCC Rail sync socket. Independently programmable feedback address for 4 inputs. Alternative, replacement: Digital booster II. External switches can drive accessory decoders - turnouts, LEDs can indicate block occupancy, turnout feedback or etc. The analog inputs can control locomotive, light detectorts. European traffic light controller, with Car System stop magnet control. For two direction traffic junction, with walk signs. Simulating the slow glow up and slow flicker out. Adjustable blinking time and period flasher. The time and period adjustable between 100 ms and 5 sec continuously. Running lights controller with 10 separated output. The module lights up the LEDs after each other. Miniature extremely short pulse flasher. Ideal for high building flasher, light towers, storm signals, adverts, etc. Sound player with 4 input. The built-in flash can store up to 47 seconds sound. Can be triggered with the reflection switch, manual switches or any other decoder. Mini light controller for Car System vehicles. Intelligent controlled battery charger for Car System vehicles. Can detect 4 separated section occupancy. The detection based on current flow - diode voltage drops, that's why can detect only few mA load on the section. Simple servo controller, with two external input.